At Eat Drink Boulder, several of the writers got together to talk about our Larkburger experiences and to taste some of their offerings. Larkburger touts giving its customers “the flavors you appreciate most, with the care you expect.” Overall, those who frequent Larkburger agreed that it lives up to this claim. The restaurant menu offers a variety of sandwich options including burgers made from Angus beef, turkey and vegetarian option as well as chicken, Ahi and Portobello mushroom sandwiches. The turkey and chicken are antibiotic free and all sandwiches are served on brioche buns, with a gluten free option available. Larkburger’s fries are skinny and nicely crisped, making them the perfect accompaniment for their sandwiches and a standout item on the menu. If you like truffle oil, it makes a very nice addition on the fries. Our group felt that both the Ahi and Portobello Mushroom were the star sandwiches. As a group, we tasted two of the salads, an often overlooked menu item. Several people did not know that Larkburger offers salads and were pleasantly surprised by the quality. The Kale Salad was the favorite. It comes with edamame, cucumber, red onion and radishes, a combination that give a nice texture as well as flavor. All of the salads can be topped with any of the burger proteins or bacon. While some thought the turkey a bit dry. The Ahi is a great complement to the kale salad and its miso ginger dressing. For the Bibb and Quinoa Salad, the grilled Portobello is an excellent topping. 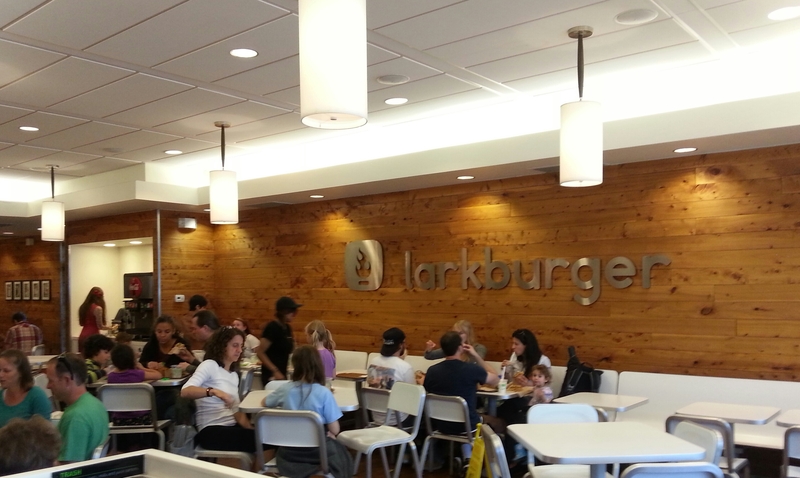 Larkburger started in Vail and has a total of 13 locations in Colorado. The Boulder location is at 2525 Arapahoe Avenue between Folsom and 28th on the north side of the street. If you choose to eat-in at Larkburger, you’ll find the restaurant to be bright and cheerful. On weekends you will find it full of families and on Mondays, kids eat free. If you want takeout, ordering online is quick and easy and you can specify a time and even a future day for the pickup. Parking can be a bit difficult and the trick is to park behind the restaurant—the same lot as the Village stores. For drinks, one can get a shake as well as the usual lineup of fountain drinks. Bottled beers, waters and Izze sodas are also available. Happy hour is 3-6 daily with drink discounts.